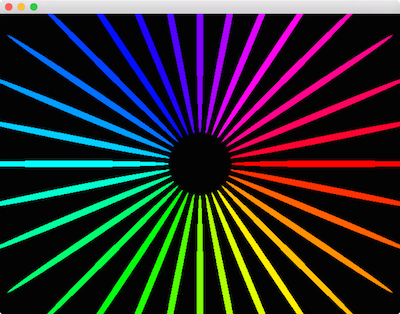 In order to use OpenGL, a Cinder app instantiates app::RendererGl UNSTYLE using the CINDER_APP macro. The most straightforward way to start to use Cinder's OpenGL API is to #include "cinder/gl/gl.h". While this does not include all of Cinder's OpenGL headers, it does include some of the commonly used ones. 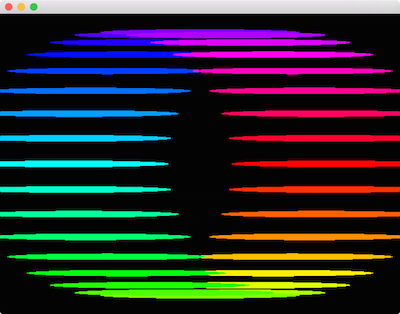 We're making use of the gl::drawSolidCircle() function, which takes a vec2 offset and a radius. 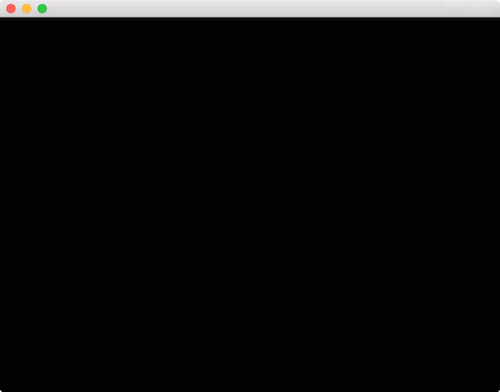 This short example also highlights the fact that by default app::RendererGl sets up a coordinate system that matches the app::Window 1:1 in pixels. Later we'll look at how to manipulate the coordinate system. 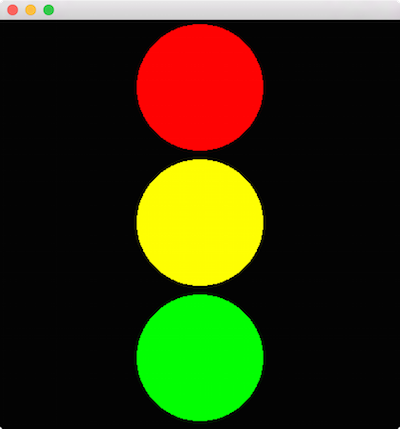 The snippet above highlights the gl::color() method. This sets a global current color, which the convenience methods make use of. Traditionally in computer graphics, transformations (operations like translation, scale and rotation) are implemented using 4x4 matrices. Cinder's Model matrix is a global transformation which is applied to any draw call. Routines like gl::translate(), gl::scale() and gl::rotate() manipulate the active Model matrix. There's a couple of things to notice in this code, the first being the call to gl::setMatricesWindow(). This sets the Model matrix to Cinder's default, window-aligned configuration when passed the Window's current size (via getWindowSize()). If we did not call this, we would keep translating the Model matrix indefinitely, and our circles would quickly be too far down to see. This is because the effects of gl::translate() et al. are cumulative, meaning the operation is appended to the current Model matrix rather than replacing it. In the case above, a call to gl::translate( 0, 150 ) translates the current Model matrix 150 units vertically; note it does not set the translation to ( 0, 150 ). Also key is to note that we draw the circles with an offset of (0,0) now, since we are relying on the Model matrix manipulated by gl::translate() to position them. For many use cases, it can be convenient to preserve, manipulate and then restore the Model matrix. Cinder makes this simple by using a stack of matrices, coupled with the routines gl::pushModelMatrix() to push and preserve the Model matrix, and gl::popModelMatrix() to restore it. Let's take a look at an example of how this can be useful. In this example, we preserve the default Model matrix by calling gl::pushModelMatrix() at the start of draw(), and calling gl::popModelMatrix() at the end. Note that we no longer need the call to gl::setMatricesWindow() as a result. Next, we translate to getWindowCenter(), so all subsequent draw calls are relative to the window's center. Then inside of a for-loop, we draw a series of circular outlines arranged in a circle whose radius is based on the height of the window. For each, we first do some basic trigonometry to determine the offset. Then we save a copy of the current Model matrix and translate by this offset. Recall that because these transformations are cumulative, this translation is relative to the window center, due to our earlier call to gl::translate(). 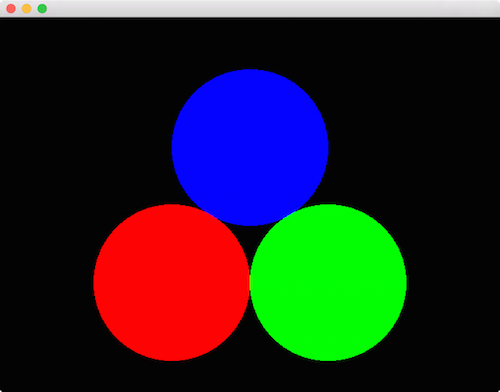 Next we set the color using HSV color and draw a circle relative to the current Model matrix. We then restore the matrix (setting it to be the window center once again) using gl::popModelMatrix(). Finally, we draw a white circle at the window center and restore the matrix to its value when first entered draw(). 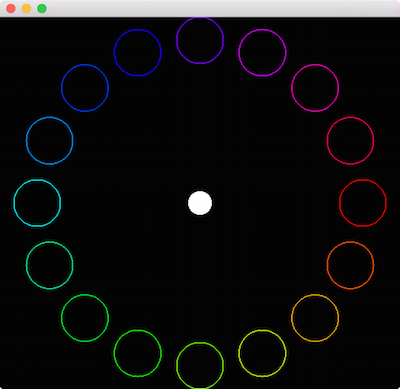 If you're wondering if we could achieve the same thing simply by passing offset * radius as the first parameter to gl::drawStrokedCircle(), you're correct. Let's look at an example which could not be achieved without using transformations. Here we'll use the gl::scale() and gl::rotate() functions. Here we've only swapped the order of the calls to gl::scale() and gl::rotate(), and it's obvious the order matters quite a bit. Consider what we're doing conceptually, keeping in mind that the operations are applied "in reverse" - they should be read from bottom-to-top relative to the draw call. First, we rotate by angle. 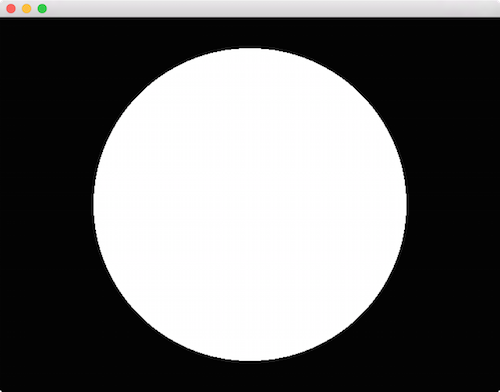 However rotating a circle results in the same circle, so this achieves no effect. Next, we apply our non-uniform scale, creating an oval, and then finally we position the oval in the circular arrangement. In the next section we'll look at how to take these concepts into 3D.